If you are a Game of Thrones fan you would have just finished watching the Season 6 finale and would be eagerly awaiting the next season. Surely, you can’t wait enough for the battle of the Queens for the Seven Kingdoms. All major players are moving into Westeros where we await to see how it all ends. Who gets the Throne? What happens to the major characters? What happens to some of the story lines and sub characters? 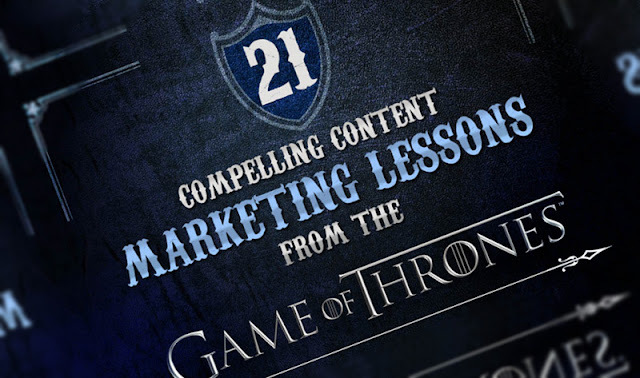 Whether you are a big Game of Thrones fan or not you can still learn a lot of digital marketing and content marketing tricks from these epic fantasy novels made into a TV series by HBO. Of course, HBO has a huge budget and an army of people working on the “on screen” and “off screen” content but some of the lessons we can learn are very simple and does not cost you an arm, leg or even a trip to the Wall (Night’s Watch). GoT is a great example of content repurposing from books into a TV series. GoT takes advantage of massive amounts of user generated content. It also has legions of loyal social media followers. The Game of Content Marketing Thrones infographic by YourEscapeFrom9to5.com.